El Comal Restaurant was opened back in the early 90s by the Herrera family who are from Guerrero, Mexico. From different areas of their wonderful country, they have brought over the finest recipes of the delectable cuisine of old Mexico and have made great strides to preserve the quality and authenticity of the food. Initially the family opened up a restaurant on Imperial Avenue in San diego which they later moved to North Park. 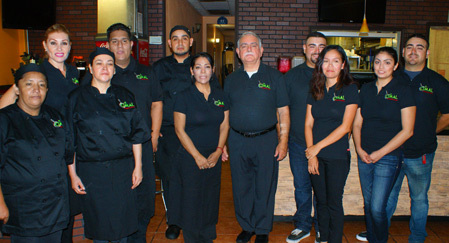 They also opened a second restaurant on "H" Street Chula Vista and later moved to the current newly renovated Downtown Chula Vista area at 262 third Ave.Our Mission Statement: To serve the most authentic homemade mexican cuisine, maintaining those delightful homemade flavors by using the freshest ingredients and authentic Mexican spices and herbs all to satisfy the palate of our varied clientele. At El Comal, we work as a family, offering our customers great service to make you feel at home, while serving those delicious Mexican dishes that taste just like home cooking - or shall we say: "hecho en casa Mexicana." Stop by and see for yourself. Our Mission Statement: To serve the most authentic homemade mexican cuisine, maintaining those delightful homemade flavors by using the freshest ingredients and authentic Mexican spices and herbs all to satisfy the palate of our varied clientele.